Subscribe to Asia Weekly newsletter! Just over a decade since the global financial crisis sent economies and financial markets into a tailspin, 2018 could mark the year in which the corner has finally been turned as China shifts focus from quantity to quality growth. 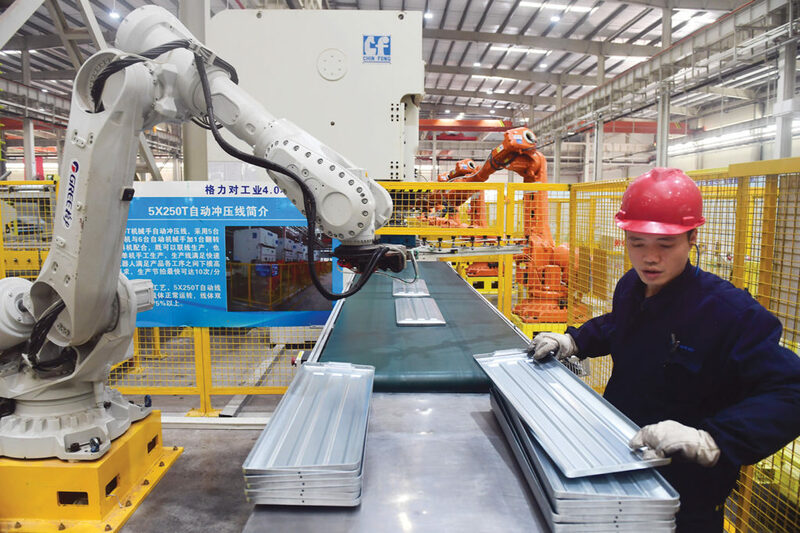 Going forward, high-quality development such as robotics and artificial intelligence (AI) will be the major theme of China’s economic policies, rather than mass-produced manufacturing which has stimulated much of Asia’s economic development. “Clearly, China has shifted its focus from quantity of growth to quality of growth,” said Tommy Xie, economist and vice-president for global treasury research and strategy with Singapore-based OCBC Bank. Xie noted that the statement from the Dec 18-20 Central Economic Work Conference, which sets the tone for China’s economic policies, does not mention the word ‘leverage’, although it was mentioned five times in the 2016 statement. Xie said perhaps the most important thing to come out of the meeting is that China has “broken the conceptual ‘deleverage’ into details” in its December statement. He said China is expected to step up its deleveraging campaign in four areas in 2018, including local government debt, control of money supply, dealing with zombie companies, and establishing a long-term mechanism for the property market. How will the world benefit from China’s economic policy in 2018? Xie said although it is too early to conclude that China will fill the gap left by the United States’ retreat from global leadership, “the latest statement from the Central Economic Work Conference clearly specifies that China is ready to lead the next phase of globalization via boosting consumption and further openness”. For the past 10 years, China has been the pivot the global economy has looked to for economic growth. Antonio Fatas, a professor of economics at graduate business school INSEAD in Singapore, said the global economy slowly improved its outlook in 2017 through a combination of a recovery from the global financial crisis and the fact that “potential risks have not materialized”. Speaking to China Daily Asia Weekly, he said the Donald Trump administration in the US has not yet caused “an economic or political crisis”, while “emerging (Asian) markets have dealt well with the weakness of 2014/15 and the potential risks of increasing interest rates in the US”. Europe has also avoided a major political crisis, he added. Leon Perera, CEO of Spire Research and Consulting, said a number of factors are contributing to the improved global economic picture. 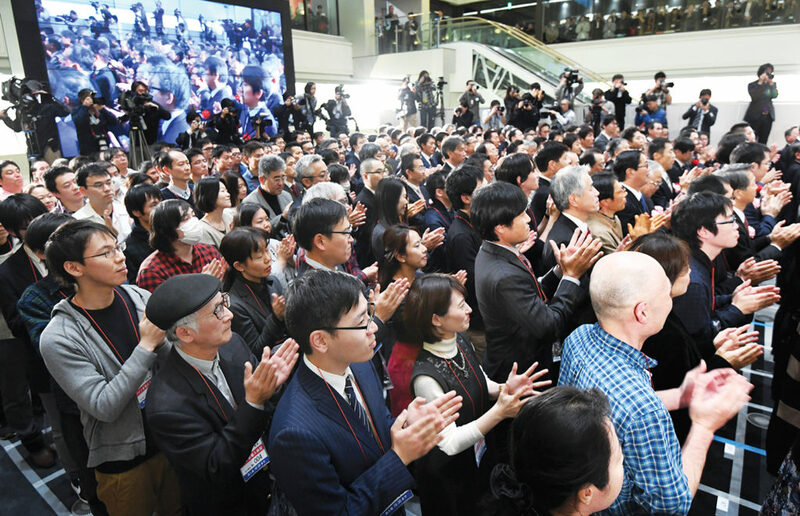 Apart from China’s continued growth, he singled out the slashing of the US corporate tax rate — from 35 percent to 21 percent when fully implemented, making it one of the lowest in the developed world — and the continued success of Japan’s economic reforms under Prime Minister Shinzo Abe. “Above all, leading global companies continue to sit on reserves of cash (and the ability to borrow even more), waiting for the right conditions to be invested,” he said. Most analysts agree, however, that attention will be on China as it focuses more on the quality of growth. Perera said disruptive technologies like AI and drones will continue to create jobs in new sectors to compensate for the traditional jobs eliminated, “though there will be global winners and losers depending on how fast countries and companies can adapt”. Latest monthly data show that real estate and infrastructure investment has decelerated. He Tianjie, an economist with Oxford Economics in Hong Kong, said the biggest surprise last year was the strong recovery in world trade growth. “(It was) initially kick-started by China in mid-2016, but since the start of 2017 the export recovery has been geographically quite broad-based,” she said. “The positive demand shock lifted factory output (and) commodity prices, boosted investment expenditure and triggered robust synchronized growth in all major economies — from small, open Asian economies to commodity exporters and other advanced economies. She said trade spillovers lead to rising investment, supporting the recovery in global growth. Another factor in 2017 was Beijing stepping up its efforts to rein in financial risks, with tightening of financial policies leading to higher market interest rates and equity market weakness. Latest monthly data show that real estate and infrastructure investment has decelerated. Rob Subbaraman, chief economist for Asia ex-Japan with financial services group Nomura, said China’s increasing focus on quality growth “will lead us to what we see as a new theme — credit risk differentiation — as China bites the bullet and starts the more painful reforms of corporate restructuring and deleveraging, while upholding a tougher regulatory regime, including stringent macro prudential measures to avoid new asset price bubbles”. “The economy appears to have started slowing again in response to rising funding costs and a cooling property market, but the silver lining is that the economy is rebalancing from a model driven by exports, heavy industry investment and SOEs (State-owned enterprises) to one driven more by consumption, services and innovative private enterprise,” Subbaraman said in Nomura’s Asia Economic Outlook report. He said Xi Jinping’s re-election as the top leader of the Communist Party of China for a second five-year term, has resolved China’s “time-inconsistency” problem. HSBC sees real GDP growth for China at 6.7 percent year-on-year in 2018, which is above the consensus forecast of 6.4 percent. Seck Tan, assistant professor at the Singapore Institute of Technology and adjunct assistant professor at the Lee Kuan Yew School of Public Policy, said the Chinese economy has played a substantial role in the global turnaround. “Firstly, its appetite for commodities drives its energy-heavy industries. Secondly, strong demand for consumables (has been created) by its growing middle- to upper-class population,” he said. “Although the Chinese economy is anticipated to slow by about 0.5 percent in 2018, it will continue to (generate) demand for commodities and consumables in order to sustain its employment numbers,” Tan said. He said dynamic challenges facing the world this year include energy and food security, political stability and economic growth, and environmental sustainability. “To date, growth of the Chinese economy has been fueled by debt — this is justified in the early stages of development,” Tan said. “For development to be sustainable, alternative means must be sought from low carbon technology for economic growth and ease of access to consumables for domestic consumption. Qu Hongbin, HSBC’s chief economist for China, said China’s economy last year surprised many observers, growing at 6.9 percent in the first three quarters. “We expect the momentum to carry into 2018, supported by continued manufacturing recovery and stable exports, which should offset some of the headwinds from the housing market slowdown and SOE restructuring,” he wrote in the bank’s outlook for this year. “All decisions to be made by Xi will easily be endorsed by the Standing Committee and the Politburo. Thus, it is fair to assume execution of economic policy will be faster, particularly in the fiscal space pertaining to urbanization and those related to the Belt and Road Initiative” — the China-led plan for a trade and infrastructure network that revives the ancient Silk Road routes. “The likelihood of State-driven investment becoming the prime economic growth driver in 2018 and beyond is high,” DBS said. There used to be a saying: “When the US sneezes, Asia catches a cold.” It was often used to illustrate just how dependent Asian economies had become on the United States for economic growth. China is now the engine that drives Asian growth, although the US should not be ignored altogether. For exporters across Asia, Chinese consumers now matter the most. Neumann noted that more smartphones are sold in China every year than in the US. And the components for these smartphones come from countries across Asia. He said commodities from Indonesia and Malaysia are now sold mostly to Chinese manufacturers and not to American firms. In Thailand and Japan, for example, Chinese mainland tourists are filling hotels and malls. “Then there is investment: China is building plants and infrastructure through much of ASEAN (the Association of Southeast Asian Nations) and further to the west. An integrated and increasingly inward looking Asian economy is in the making,” Neumann said in the bank’s global outlook. His comments came before the US House of Representatives and Senate approved President Donald Trump’s sweeping tax bill, the Tax Cuts and Jobs Act. While most ASEAN economies have done well over the last decade, analysts say it is too early to say just what effect the US tax cuts will have on the region. Taimur Baig, chief economist and managing director for group research with Singapore-based DBS, said he did not think the tax cuts will have a major impact on the “direction of the US dollar or rates”. “On the currency (front), there has been a lot of talk about how flows could be diverted to the US, thus strengthening the dollar. But this line of reasoning ignores the fact that most US corporate earnings kept overseas are already in US dollar-denominated assets,” he said. “Indeed, many companies that leave cash abroad have issued bonds in the US (Apple being the most notable example). As they repatriate (these funds), these companies will issue less bonds, leaving the overall supply or demand for US dollar-denominated assets largely unchanged. Analysts say lower tax rates increase returns on capital, potentially diverting investment from the rest of the world to the US. Baig, however, said this is probably a bigger risk for Europe and Latin America than Asia. “Multinational corporations that were, on the margin, considering offshoring some production may pause to take advantage of the lower domestic rates, but the factors of production that are Asia-oriented, especially those related to the electronics supply chain, are very unlikely to move back to the US,” he said. The weak US dollar has also seen capital pour into the region, especially in countries like the Philippines. The Manila-based Asian Development Bank (ADB) said robust labor markets, buoyant infrastructure spending and strong global demand contributed to lifting growth in the ASEAN region in 2017 to 5.1 percent — a four-year high for the 10-nation bloc. ADB economists say these tailwinds are expected to remain largely in place and fuel another year of vigorous growth in 2018. Firm demand for technological goods will support exports of electronics, while higher commodity prices will support exports of minerals. They say business-friendly reforms and a pipeline of infrastructure projects should boost investment. A busy political calendar too could result in higher government spending ahead of elections in the region during the year. Malaysia is due to hold general elections sometime between March and May. Indonesia is to hold regional elections in June, while general elections are expected to take place in Thailand in November. Seck Tan, assistant professor at the Singapore Institute of Technology and adjunct assistant professor at the Lee Kuan Yew School of Public Policy, said China has played a substantial role in the turnaround of most regional economies. This has been largely driven by China’s continued appetite for commodities to fuel its energy-heavy industries and strong demand for consumables from its growing middle- to upper-class population. “Although the Chinese economy is anticipated to slow by about 0.5 percent this year, it will continue to drive demand for commodities and consumables in order to sustain its employment numbers,” Tan told China Daily Asia Weekly. He said China’s demand for commodities has benefited commodity-rich Australia. At the same time, the consumption-led Chinese economy is driving the ASEAN economies and Japan. Investment approvals in the Philippines by the Board of Investments soared to 617 billion pesos ($12.3 billion) in 2017, the highest in the board’s 50-year history, according to a report on Dec 19 in The Philippine Star. This was 39.5 percent more than 2016. According to the report, the investments totaled 426 projects, mainly in the infrastructure and power sectors. The agency said these projects would generate around 76,065 jobs when fully operational. “This validates business confidence in President Rodrigo Duterte’s economic programs to ensure inclusive growth and shared prosperity for the country. The influx of investments is definitely steamrolling, as we are expecting sustained higher investments for the next five years,” Philippine Trade Secretary Ramon Lopez told the newspaper. Over the coming months, the US central bank will likely announce a gradual reduction of its balance sheet. It is unclear how this will affect capital flows, and hence funding costs, in emerging Asia. HSBC’s Neumann does not share the same enthusiasm for Asia as many of his colleagues. Now partly tethered to the US Federal Reserve Board and its interest rate policy, and partly to Chinese growth, much of emerging Asia is in a “precarious situation”, he said. Neumann also drew attention to the fact that “hardly a week goes by without new stipulations for the country’s financial institutions to curb their risky lending”. These new regulations in China “may not yet have made a dent, but regulators are pressing ahead”, he said, adding that they are “hinting they will push for full implementation in 2018”. At the same time, it is worth noting that the Fed is tightening the screws. Not rapidly, but unrelentingly. “Investors, for now, seem relaxed. The US economy appears robust enough to take the monetary squeeze in its stride. Less certain is whether Asia can,” Neumann warned. He pointed out that in recent years debt has climbed inexorably in many economies, such as Hong Kong, South Korea, Singapore, Malaysia and Thailand. Yet, funding costs have dropped, due in large part to a “generous Fed and a weaker dollar”. Global investors may have reaped a bonanza on the Hong Kong share market in 2017 but they should not be complacent this year. The Chinese mainland’s deleveraging process and economic slowdown, the passage of the US tax reform bill and the US interest rate hike cycle are all likely to affect the financial markets. Spurred by share price gains of technology titans, abundant market liquidity and mainland capital flowing south to snap up Hong Kong-listed shares, the city’s blue-chip benchmark Hang Seng Index (HSI) rallied 36 percent in 2017. The Hang Seng China Enterprises Index (HSCEI), which tracks price movements of mainland companies listed in Hong Kong, advanced more than 24 percent in the same period. The HSI was the best performer last year among the world’s major developed markets. It outperformed the US and other European peers for the first time since the global financial market rebound in 2009. Hong Kong’s share market surge in 2017 epitomized the performance of other Asian markets in the same period. Asian equity markets from India to Indonesia registered record highs despite the backdrop of the Democratic People’s Republic of Korea nuclear crisis, the Chinese mainland’s financial deleveraging, and a stronger Japanese yen. Buoyed by the success of technology giants such as Tencent, Alibaba and Samsung Electronics, as well as the prospect of bumper corporate earnings, financial analysts anticipate further gains for Asian equity markets, where valuations remain attractive relative to more mature markets. They say the positive catalysts are still firmly intact. “Hong Kong stock market valuation is still significantly lower than that of mature markets like the United States. With emerging markets set to lead the global recovery in 2018, alongside the Chinese mainland’s continuous economic transformation, the Hong Kong stock market may extend the rally and stay robust,” predicted Cheng Shi, managing director, chief economist and head of research at ICBC International Holdings, the research arm subsidiary of Industrial and Commercial Bank of China. DBS Vickers, the equity trading arm of Singaporean bank DBS Group, sees mainland capital continuing to snap up Hong Kong shares in the first half of 2018 and predicts the HSI could swell to 33,000 this year. The HSCEI is tipped to soar to 13,500, and at a moderate price-to-earnings ratio of 9.4.
Credit Suisse anticipates a 10 percent return on the Hong Kong equity market, mainly driven by earnings growth without further valuation re-rating. At current levels, the HSI is trading at a 12-month forward price-to-earnings ratio of 12.4, while the HSCEI is trading at 7.2 times. BOCOM International, the securities research arm of Bank of Communications, expects the HSI should edge higher this year than the peak level registered in October 2007 as corporate earnings can grow 10 percent. 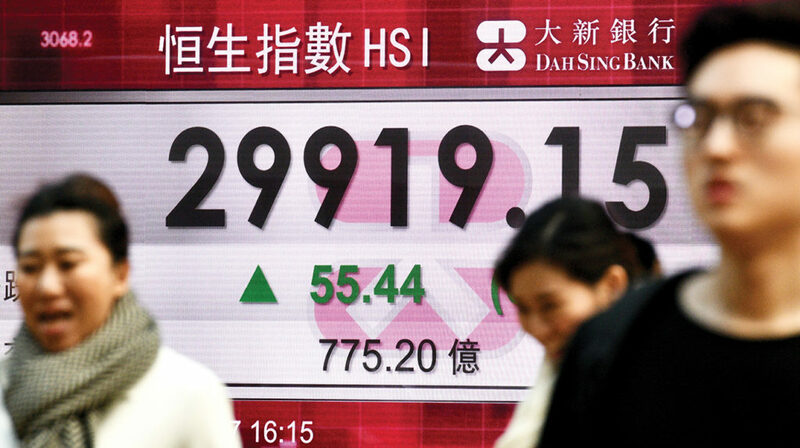 The HSI skyrocketed to an all-time high of 31,958 on Oct 30, 2007. Chay Kai Kong, a senior portfolio manager at Manulife Asset Management, the asset management arm of Canadian insurer Manulife Financial, said: “We expect Hong Kong stocks to continue to record inflows for the next two to three years as southbound capital inflows continue to grow that can provide liquidity to the market. Taking an overview of Chinese mainland, Hong Kong and Taiwan equities, Chay pointed out that the forward price-to-earnings ratio for 2018 is around 13.5, which is below historic peaks and less than developed markets such as Europe and the US. The passing of the US tax reform bill in December could have far-reaching consequences for global capital flows, affecting Hong Kong equity market performance in 2018. Some other analysts are more cautious, saying the stock market bonanza cannot be repeated this year. They cite concerns such as the US interest rate hike cycle and the US Federal Reserve Board’s balance sheet reduction, the slowing of the mainland economy and corporate earnings, as well as mainland policy uncertainities denting market sentiment. Financial deleveraging on the mainland is one of the market worries as the tightening of financial policies has led to higher market interest rates and equity market weakness. Following earlier measures to deleverage the bond market and rein in excesses in shadow banking, the central government in November announced a tightening of financial regulation, notably with regard to asset management products and lending to non-bank financial institutions. Financial conditions are being tightened through regulatory instead of monetary policy means. Louis Kuijs, head of Asia economics at think tank Oxford Economics, cautioned that while the tightening of financial policy on the mainland should not cause a substantial economic slowdown, “a slightly faster-than-projected slowdown in overall credit growth could easily result in a significantly more pronounced economic slowdown”. Secondly, the passing of the US tax reform bill in December could have far-reaching consequences for global capital flows, affecting Hong Kong equity market performance in 2018. The first drastic tax reform in the US in the last three decades will slash the corporate tax rate from 35 percent to 21 percent and levy a 15.5 percent tax rate on repatriated cash earnings by US companies. It is expected that these two measures will attract global capital back to the US, reducing the fuel in the tank to support the global equity market rally. Besides its effect on capital flows, opponents of the US tax reform have said it will add $1.5 trillion over the next decade to the $20 trillion US national debt, and that it can only expand US economic growth by 0.8 percent over a decade — far lower than the anticipated 3 percent expansion. Citibank analysts have said they expect the HSI to drop to 29,500, with its level depending on factors such as the pace of monetary policy tightening by global central banks, the geopolitical situation, and the pace of financial deleveraging on the Chinese mainland. Market watchers who believe that last year’s rally in Hong Kong stocks cannot be sustained are expecting more volatility this year. “Institutional investors around the globe are wary of fragile market conditions, distorted asset prices and systemic risks caused by central bank interventions,” cautioned Fabrice Chemouny, head of Asia Pacific at Natixis Investment Managers. According to a survey by Natixis Investment Managers released in December, two-thirds of the surveyed decision-makers at 500 institutional investment firms expect asset bubbles to have a negative impact on performance in 2018. As 2018 begins, the global economy is set for another year of sustained GDP growth at a pace of 3.2 percent, matching the growth rate in 2017. In the United States, the combination of robust consumer spending and the $1.5 trillion tax reform package approved by Congress and signed into law by President Donald Trump in December is expected to underpin the country’s GDP growth momentum. A positive outlook for US industrial production and new manufacturing orders in the first half of 2018 was signaled by the IHS Markit US Manufacturing Purchasing Managers’ Index for December, which rose to 55.1, the highest reading since March 2015. An economic rebound is continuing in the eurozone led by Germany, with the IHS Markit Eurozone Manufacturing Purchasing Managers’ Index for December hitting its highest level since 1997, signaling strong growth in eurozone industrial production in early 2018. Meanwhile, China will continue to act as a key global growth engine, with its GDP forecast to grow at 6.5 percent in 2018, while the broader East Asian growth momentum is also expected to remain robust. Against this positive global macroeconomic backdrop, the outlook for Asian equity markets will be supported by healthy prospects for corporate earnings growth in most large Asian economies, boosted by strong household consumption growth across most Asian emerging markets, led by sustained firm growth in Chinese consumer spending. 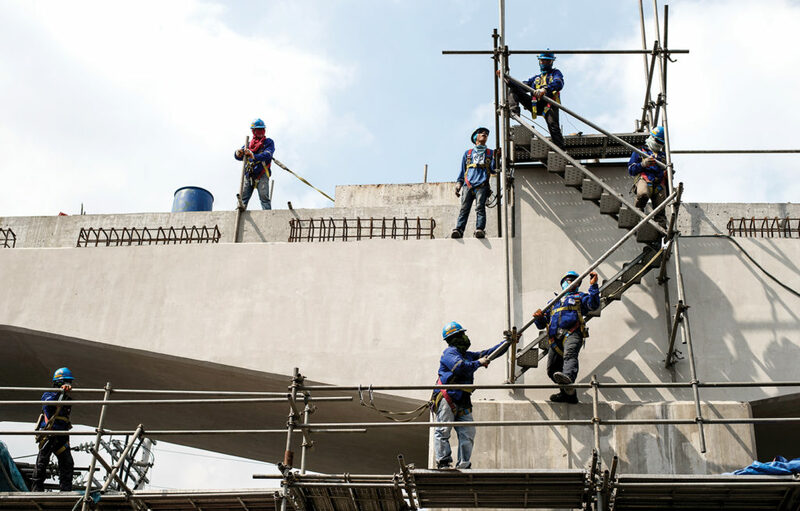 Increased public sector investment in infrastructure in a number of Asian economies, including Indonesia, Malaysia, the Philippines and India, will help support the medium-term outlook for these countries’ construction sectors. The outlook for the Asian electronics manufacturing supply chain is also positive for the first half of the year, with the IHS Markit Global Electronics Purchasing Managers’ Index for November signaling continuing strength in global electronics output and new orders. However, a key concern for Asian financial markets will be the pace of monetary policy tightening by the US Federal Reserve Board, with current financial market expectations for three US rate hikes in 2018. While Asian equity markets should be resilient to a gradual further tightening of US monetary policy this year, an important downside risk would come from any acceleration in the pace of US rate hikes due to signs of rising US inflationary pressures. Asian currency markets are also likely to be affected by US rate hikes in 2018, as it will lift yields for the dollar relative to other currencies, favoring some dollar appreciation against most Asian currencies, particularly as further US policy rate hikes are expected in 2019. However, the relative movements of different Asian currencies will also be affected by country-specific factors, such as external account movements and a domestic monetary policy stance, with several Asian countries expected to have a tightening bias in 2018, including the Philippines, Malaysia and South Korea. For the yuan, continued strong economic growth and robust consumer demand are expected to support a stable exchange rate against the dollar in 2018, assisted by the macro-prudential measures that have been implemented by the Chinese authorities during 2016-17 to curb capital outflows. Capital outflows from Chinese mergers and acquisitions are estimated to have declined by around 40 percent in the first 10 months of 2017, with continued tight controls on capital outflows anticipated for this year. Prospects for stronger US growth, coupled with the solid performances of the Chinese and eurozone economies, resulted in a rally for world commodity prices in late 2017. The People’s Bank of China is also likely to implement further regulatory measures to tighten liquidity conditions and deleverage the economy, while leaving policy rates on hold. Due to the Hong Kong dollar’s fixed peg to the US dollar, the Hong Kong Monetary Authority will be forced to tighten policy rates in line with the US Fed, resulting in the gradual tightening of the city’s monetary policy. This will gradually push up borrowing costs and could dampen residential property prices in Hong Kong. In contrast, the Bank of Japan is expected to continue to maintain its ultra-loose monetary policy, leaving its policy rate at -0.1 percent and keeping the 10-year Japanese government bond yield at close to zero. The yen is expected to depreciate slightly against the dollar in both 2018 and 2019, due to the impact of tightening US monetary policy, which will push up yields for the dollar relative to the yen. The US and eurozone entering 2018 with strong positive momentum in industrial output and rising new manufacturing orders has underpinned commodity prices entering the new year. World oil prices strengthened in late 2017, helped by the decision of the Organization of the Petroleum Exporting Countries (OPEC) with Russia at the end of November to extend production cuts for another nine months. Prices have also been boosted at the outset of 2018 by anti-government protests in Iran, which have lifted geopolitical risk premiums. The synchronized global expansion in GDP growth momentum, led by developed markets, is also underpinning robust oil demand growth. World liquids demand is poised to rise by 1.9 million barrels per day this year, after increasing by 1.8 million barrels per day in 2017. Overall, the global macroeconomic outlook at the outset of 2018 is positive, boosted by prospects for continued synchronized growth momentum in the world’s largest economies. Nevertheless, stronger global oil production during 2018 is expected to mitigate the impact of rising global demand, despite OPEC’s production restrictions, due to higher non-OPEC oil production. The upturn in world oil prices in the fourth quarter of 2017 is expected to trigger increased US oil production, constraining the oil price by mid-2018. However, as highlighted by the violent protests in Iran, geopolitical factors in the Middle East remain a source of potential upside risks to the world oil price. Overall, the global macroeconomic outlook at the outset of 2018 is positive, boosted by prospects for continued synchronized growth momentum in the world’s largest economies. This will be supportive for Asian equities markets. Although rising US interest rates will support some moderate dollar appreciation against many Asian currencies, regional equity markets should be resilient to a gradual and measured pace of Fed tightening during 2018. A key downside risk would be from any upturn in US inflation and wage pressures, which could result in more rapid US monetary policy tightening than currently priced in to financial market expectations, which could trigger volatility in Asian currencies, equities and debt markets. The writer is Asia-Pacific chief economist for IHS Markit. 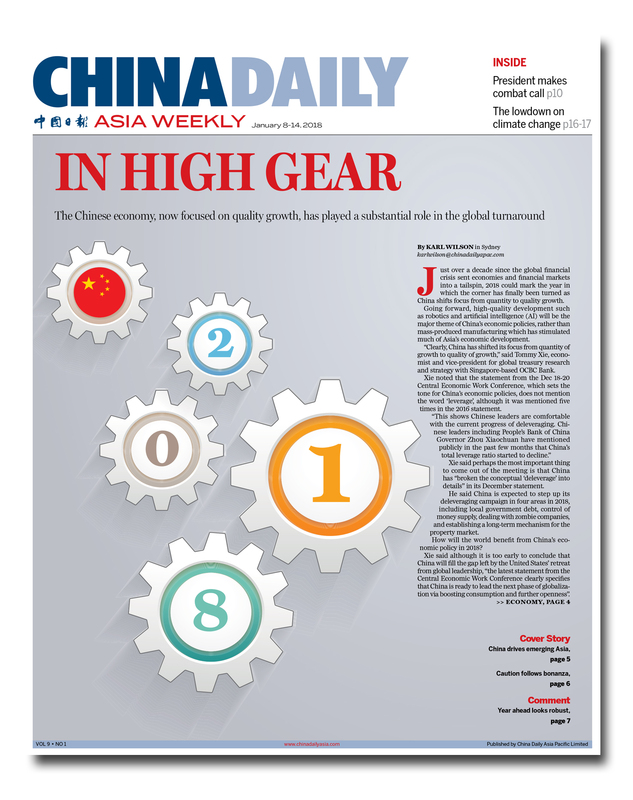 Asia Weekly provides insights about both China and the region in multimedia format. COPYRIGHT BY CHINA DAILY, ALL RIGHTS RESERVED.